This all came about from the adrenalin rush of being within touching distance of ending circuit flying and being allowed to go somewhere, anywhere, other than round and round the airport. Had I been thinking sanely I may have spaced this lesson out a bit more, but the counter-risk if you do, is you might not be “as good” next time you get in the plane. I’ve had my share of feeling like an hours flying was actually just one small step backwards for man. The aspiration then was to get signed off to fly solo…..then get the remaining minutes of solo time in the bag. The wind had other ideas……. We’d take G-UFCB…. Historically, this plane doesn’t like me, so not a great start. Crosswind was at 7 knots, 90 degrees to the runway direction (Arrgh!) and gusting up to 9 knots. Right from the start this was looking questionable. So questionable in fact that the idea of doing circuits was scrapped by the instructor and instead the plan was to set out and do the beginnings of Nav. I’ve been going round in circles for so many lessons now that the opportunity to go somewhere, anywhere else was very appealing. The wind didn’t seem that bad while checking out the plane and either the instructor got told to scrap his plan and not take me out of the circuit until the boxes had been ticked. Or he to was thinking it might just work…. All checked out and taxi clearance granted, we were off pretty quick. There are some lessons I can remember every second, others (normally the ones where it goes wrong), I can’t remember what happened, when. As this is one of the latter, you can conclude it didn’t really go that well. The wind successfully blew me left of track on the climb up, not a great start but the rest of the circuit was ok, bit gusty but no worries, it was a 90 knot, 1000ft about as good as they come circuit. Turned to early on to final: When there’s a solid cross wind this is easier to do then it sounds, because you have airspeed but your ground speed is rubbish, so if you start a turn at the same point as always you’ll complete it having had a tighter turn relative to the ground. Think of it like driving a car, if you turn the steering wheel to a set point, the tightness of the turn and therefore what you’re facing after 90 degrees of turn, depends on your speed, slower you drive while turning the tighter you can turn. Considering I’ve done a million circuits and I’ve been solo now five times, I find myself bemused at still getting this comment. There are moments I wonder if these landings are any better than the first landings I ever did? I look back and I think this comment was the death of the lesson, I would spend the next 50 minutes trying to improve this and the more I moved away from flying it “my way” (Whatever that is), the worse it all got. Much better climb, compensated for the cross wind and stayed on track this time. The turn on to final also got the correction treatment, the landing however in my mind was forced down and the attempts to get more back pressure on the controls lead to quite a high nose attitude, the stall warner going off still about 20ft off the runway and basically the last 50ft felt like a total mess pulled together. A positive was that when it did touch down, it did it quite softly. I’m going to keep this short, while I generally enjoyed the flying, this lesson makes me grumpy. 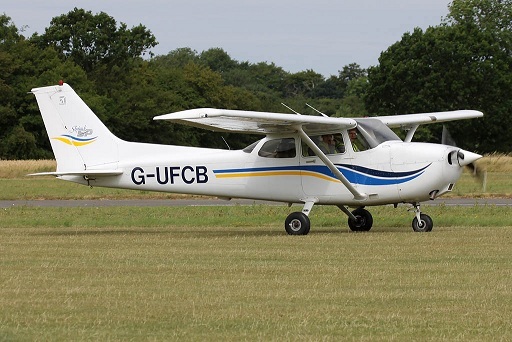 Just before turning base on the next one I was asked to do it flapless, I should have known from that far out I’d never get it down with no flaps……I didn’t, we were still 300ft above the runway upon crossing the threshold, so we aborted. The rest were progressive levels of rubbish, hard landings, all over the place landings. Hindsight is 20:20, but lessons like this are where you need it to be called quits early. The objective right now is not to tidy up this or that, we didn’t come up here to fly cross winds or tidy up cross wind landings. It’s to get solo time in order to tick that box and move on. Waaaay back when I started, one of the head instructors used to occasionally sound really fussy to me about not wanting to send other people in borderline conditions for the objective they were there to achieve. I even had a few lessons cancelled where he’s said “You need solo time, you won’t get it in weather like this, so there’s little to be gained from being with an instructor at this point…..” You start your training thinking this all sounds a bit pessimistic, but I’ve now come to conclude that this is a voice of experience. I’m going to leave this post positive though, my crosswind flying is better now then it once was. This entry was posted on Saturday, September 8th, 2012 at 8:48 am by PHC	and is filed under Actual Lessons, PPL Course. You can follow any responses to this entry through the RSS 2.0 feed. You can leave a response, or trackback from your own site.